Like a squirrel hurrying to bury its nuts for the winter, I’ve been gathering the end of the season’s eggplants. You see, at the Belen Farmers’ Market, I met a great young farmer who said she only eats eggplant one way: as baba ganoush. I asked her how to make it, and she handed me a recipe that has been pinned to my fridge ever since. If you’re not familiar with baba ganoush, it is a traditional Middle Eastern dip made of pureed eggplant, tahini (sesame paste), garlic, salt, parsley, and lemon juice. It’s great scooped up on pita bread or chips, spread on sandwiches or eaten with roasted potato. I knew that my family liked the dish, but I had no idea my 17-year old daughter would go hog-wild for it. The first batch was gobbled up in no time and soon she was begging for more eggplant. So began this season’s run on baba ganoush at our house. I have made baba with many varieties of eggplant, but I have found that it is easier to use black beauties (the large dark purple variety), because there is more flesh to scoop out. If you have other eggplants on hand, though, don’t let that stop you. Now it is the beginning of October, and light frosts are well underway. Knowing that local eggplant will soon be gone for the season, I figured I’d better grab what I can and make some more baba for the freezer. 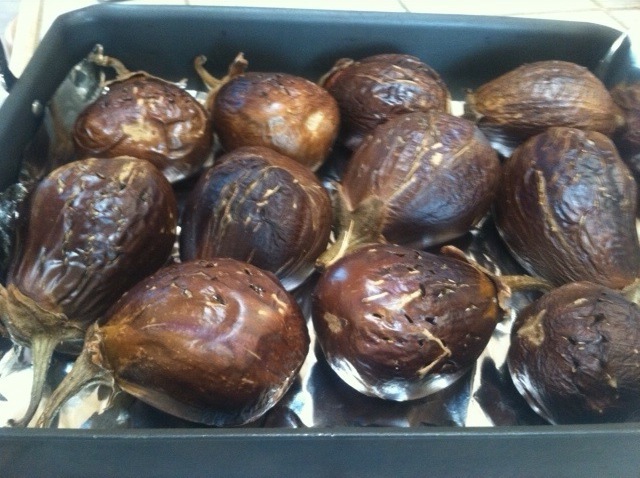 The eggplants always take longer than 20 minutes to brown. While the recipe says to drain off the liquid before scooping the pulp into a food processor, I’ve never found any excess liquid to drain off. All I do is give the cooked eggplant a squeeze over the sink and a tiny bit of liquid comes out the poked holes. The recipe calls for 1 large eggplant, but I’ve never made it with just one. In fact, I usually have an assortment of sizes so I ballpark guess when it comes to scaling up the other ingredients. Baba ganoush is a forgiving dish, so don’t be afraid to just use your taste buds when trying to decide how much tahini and lemon juice to use. I’ve also always doubled or tripled the amount of garlic, which also means I also increase the amount of salt getting mashed with the garlic. Good thing cooking isn’t usually an exact science! After you make your baba ganoush and if your household hasn’t devoured it, it freezes very well in plastic containers. The baba ganoush will probably be room temperature by the time you’re done making it which is good because you never want to freeze something while it’s still warm. Also, as with any food you’re freezing, try not to leave much space at the top of the container since air is the enemy of frozen food. If you were freezing something with more liquid you would want to leave room for expansion but you don’t need to worry about that with this recipe. Finally, be sure to label it. I’m compulsive about this (and I’m not compulsive about much) because even though I swear I’ll remember what it is, I won’t. It’s also a nice final punctuation to the process. So there you have it. If you still see some eggplant at your local farmers’ market, scoop some up and try this healthy, only slightly addictive dip that is great to have on hand. Preheat oven to 450º F. Prick eggplant with a fork and place on a cookie sheet lined with foil. Bake the eggplant until it is soft inside, about 20 minutes. (It should look charred on the outside.) Alternatively, grill the eggplant over a gas grill, rotating it around until the skin is completely charred, about 10 minutes. Let the eggplant cool. Cut the eggplant in half lengthwise, drain off any liquid, and scoop the pulp into a food processor. Process the eggplant until smooth and transfer to a medium bowl. On a cutting board, work garlic and salt together with the flat side of a knife until it forms a paste. Add the garlic –salt mixture to the eggplant. Stir in the parsley, tahini and lemon juice. Season with more salt, to taste. Garnish with additional parsley. Four Moons Farm, a chemical- and pesticide-free sustainable farm in Los Lunas, is offering CSAs for 2014! Email Molly at Hokaiye@yahoo.com for details.